We have tentatively approved locations for upcoming hikes. Based on Parks Canada guidelines, a site inside the Banff National Park may only be used only once every 5 years. Since several sites are shared with the Trail Riders of the Canadian Rockies, this means that many sites are only available once every 10 years. In 2019, Parks Canada will undertake their planning process for the next ten years. This plan will be tabled in Canada's House of Parliament in 2020. Until this plan is passed by the federal government, Parks Canada cannot advice us of which sites Skyline Hikers can use after 2020. This is a favourite location inside the Banff National Park amongst many Skyline Hikers which was last visited in 2010 (see photo). 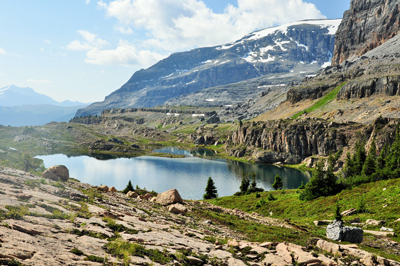 The site is accessed from the Mosquito Creek trail just off the Icefields Parkway. 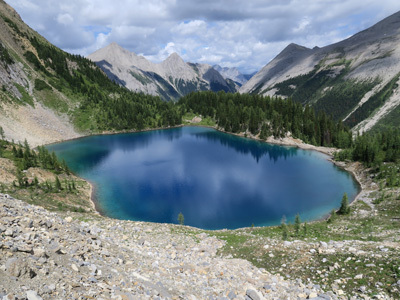 On the British Columbia side of the continental divide and on the Banff National Park boundary, this is a popular site with our hikers and was last visited in 2016 (see photo).